Hundreds of Palestinian Arabs rally in Ramallah, back Abbas' position on Trump's "Deal of the Century". 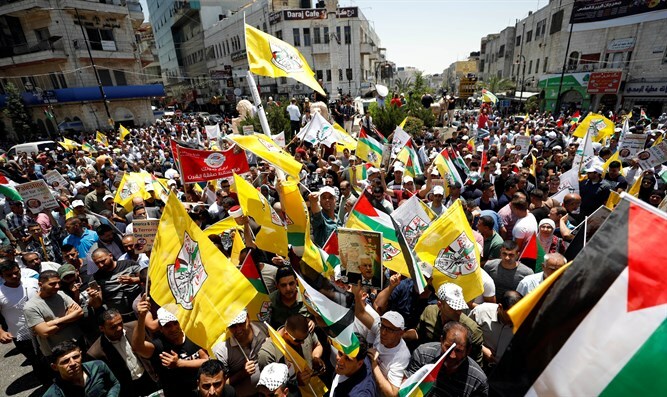 Hundreds of Palestinian Arabs rallied in Ramallah on Monday to protest attempts by the United States “to impose its plans in the area”, the Wafa news agency reported. They raised Palestinian flags and pictures of Abbas while chanting anti-deal slogans, according to Wafa. Mahmoud Aloul, deputy head of Fatah movement, condemned the “Deal of the Century”, saying it will not work. Last week, Trump’s senior adviser, Jared Kushner, and his Middle East envoy, Jason Greenblatt, visited the region for talks on Trump’s peace initiative. However, they did not visit Ramallah or meet any PA officials due to Abbas’ boycott of the U.S.
Last week, Trump declined to offer a timetable for announcing his proposed Middle East peace plan, saying only that "progress" had been made in tackling the complex issue. Speaking after a meeting at the White House with King Abdullah II of Jordan, Trump hedged when asked by reporters to give a schedule for rolling out the peace plan that Kushner is working on. "A lot of progress has been made in the Middle East, a lot," he said.